I’ve never been a big fan of seafood, but I do love salmon. It tastes great. It’s really good for you, and it’s really quick to make. I’ve recently decided to break my habit of not really trying new things by committing to one recipe a week that I wouldn’t make otherwise. 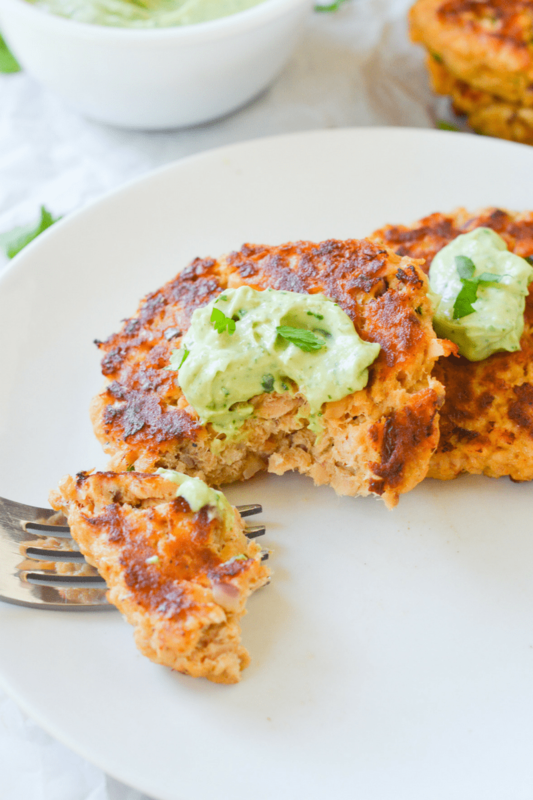 These salmon cakes are crazy fast to make (less than 15 minutes, y’all!) and they’re great for storing in the fridge for eating later. Easy meal prep for the win! One major key to this recipe’s success is the INCREDIBLE Sarayo sauce (affiliate). I used to make my own, and regularly would for recipes like these 5 Minute Spicy Tuna Rolls, but when I got the Sarayo in this month’s Keto Krate (affiliate) the game was changed forever. Another star of the recipe is the yummy avocado creama that it’s topped with. This adds a delicious and nutritious freshness while upping the fat content of the meal. One note about this recipe: you can use fresh salmon, and cook that, but it’s not a huge deal for me. I often go for ease, accessibility and convenience over wild caught, free range. You do you! 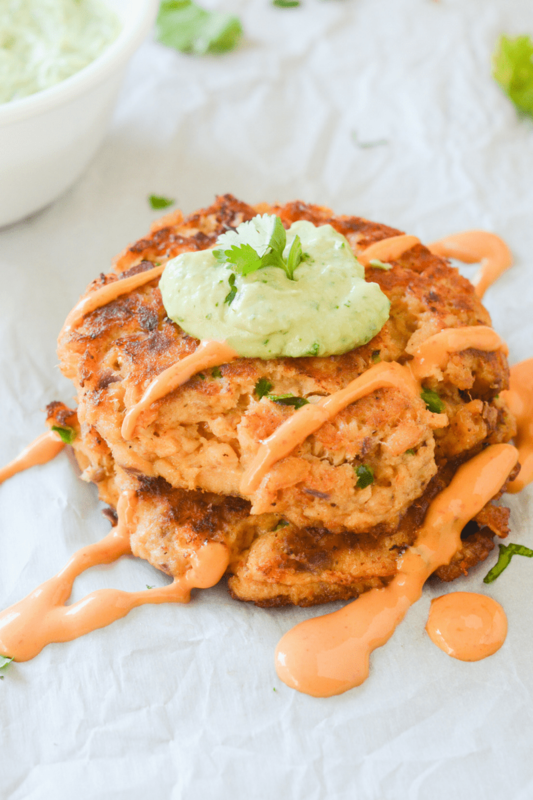 Here’s how to make the easy keto salmon cakes! Just made these and they are beyond what I expected!! I’ll definitely be making these again…and again!???? What is the orange sauce that is drizzled over the salmon cakes in the first picture? It looks delicious! It’s an avacado aioli, the recipe is down a little farther. 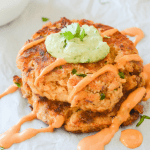 It’s Sriracha mayo that’s drizzled on the salmon cakes not avocado aioli. However, it looks really good. I can’t wait to try it out! Just finished making the recipe and they are delicious! I made a second batch and added four minced green olives and two tbsp of chia seeds. I didn’t have the pork for the second go-round, but in lieu, added 1/8 cup of coconut oil . . . . the patties held together just as well as the first batch. Phew! Thanx Sam, absolutely lovin’ your site and recipes! PS. Merry Christmas to all, continued good health and happiness through the New Year! ???? This was a huge hit with my salmon hating family. ???? Should the pork rinds equal a fourth cup before or after grinding? After. I tend to throw a whole bag in the food processor and keep it in a sealed container so I can just scoop out when I need some. So good! I made these tonight with some minor changes (just because of ease or lack of ingredients). I substituted onion flakes and nixed the jalapenos but these were still delicious! Next time I might half the avocado cream sauce ingredients because I had a lot left over. Thank you for sharing this recipe! I had two for dinner and am saving two for lunch tomorrow! I thinned the leftover avocado cream and used it as a salad dressing. It was so good! Do you think/know if these would freeze well? I’m needing to make meals ahead and freeze for my family to cook later. I haven’t tried freezing them, but it should freeze fine at least for the short term! These were fast, easy, and fabulous! We didn’t have any pork rinds in the house so I used 1 T of almond flour, 1 T of Parmesan & 1 T of breadcrumbs. They turned out great! Thanks for crafting and posting such an amazing recipe! This turned out wonderful! I’m always trying to find new ways to cook salmon. Not only was this a great recipe for salmon but also for chicken, one of our sons is allergic to fish so whenever I make a fish dish I always make the same thing with chicken. This recipe worked wonderfully for that as well. Making it again tonight as a matter of fact! Well done! so looking forward to trying these! do you recommend anything other than the pork rinds? I’m not a fan! You could leave them out completely but they don’t hold together as well. I’ve gotten patties that way, they’re just more delicate. You could also try a tablespoon of almond flour perhaps. This recipe was awesome! I added a little extra pork rinds as well as a squirt of Dijon mustard. I cooked them in bacon grease instead of oil, it was a hit! However, do you have the macros confused? There’s no way this much salmon only has 10g of protein and 50g of fat! I’m assuming you accidentally reversed them? Maybe the macros include all the sauces? These were awesome! My husband smoked salmon here st home and I used it to make these. The combo of the sauces is delicious. Sarayo is just Sriracha Mayo – I had both so mixed them for my own level of spicy. My 13 y-o daughter said they were Instagram worthy! I will definitely make these again. Oh my gosh yall, These turned out just like the ones my grandmother used to make! I mean, not just like flavor-wise (a my maw didn’t use jalepinoes or the sauce), but these have the exact same texture and consistency. These are the kind of salmon patties I grew up on, crunchy, flakey, and they don’t last long before they’re messily devoured. Now I made only 2 changes to this recipe: I used green onion instead of red, and I used lime in the sauce instead of lemon. I made a quick batch of cauliflower rice to go with it (Tossed the riced cauli, tomato paste, olive oil, garlic and onion powder, salt n pepper, in a skillet till it was more rice-like and garnished with cilantro). Beyond amazing! This is a recipe is a 10! I will definitely make them again. I couldn’t get the salmon to stick together enough for a true “Pattie” – the flavor is awesome but wish I could try the crispy patties! Wow. Disappointed. Maybe add an extra egg to keep them from falling apart, skip the avocado sauce, and adjust the flavor altogether. Not a success at my house. I loved this recipe, but mine ended up more as a salmon patty salad since they completely fell apart when I was cooking them. I used the amount of ground pork rinds you suggested, but they just didn’t want to stay together. Any suggestions on how to get them to stick together since I’m definitely going to be making this again? I loved the flavor, but i am not sure why I could not keep the patties together. What did i do wrong? I am definitely wanting to try these again as they were very tasty! I just tried making these and all of them fell apart. What am I doing wrong???? Thank you!! This recipe was AWESOME. I used alvacado oil mayo. It’s a keeper!!! Going into my Evernote recipe files. They came out great. So good! Wow! I never write reviews but these?! I’m in love. I used a big can of salmon and doubled the recipe. I didn’t want to go to the trouble of chopping onions or halepenos. I used hot and spicy pork rinds and it was sooooooo good. I didn’t have avacados either so no special sauce but spicy mayo worked just fine. DELISH!! Can you use fresh salmon that you just baked? I haven’t tried it myself, but someone just commented recently that they tried it this way and it worked out great! I used a huge salmon steak and doubled the recipe. I cooked the salmon in a pink salt block. I didn’t have jalapenos on hand so I used red pepper flakes. I also subbed in old Bay seasoning. My avocados weren’t ripe at all so I subbed in pickled jalapenos for spicy tartar sauce. These are the best dang salmon cakes I’ve ever had!! Omg! So good! Best salmon cakes I’ve ever had. And I love the avocado cream sauce with them! I made a small batch. I didn’t add pork rinds I just dusted both sides with Parmesan cheese and they kept its form. Tasted really great with the avocado aioli. Thanks great for my Keto diet! I skipped the pork rinds and jalapeños (didn’t have either on hand; doubled the garlic and chili powders to make up for the lost spices) and used leftover steamed salmon. The mixture was a little runny going into the pan, but maybe since I preheated the pan with olive oil (no avocado oil on hand), they were beautifully formed when I flipped them at 4 minutes per side!! Thanks for the easy recipe, they were delicious!! I made this tonight, but had to mix it up a bit due to not all ingredients on hand. Used almond flour and onion powder and fried in bacon grease. So delish! I’ve made these when I first started keto in July and I’m glad I rediscovered this recipe. Made these as burgers, for tea, Good Friday. Only addition I made was a tablespoon of lemon juice, we like a bit of zest. Delicious! Even fussy 9 year old gave them two thumbs up. Delicious!! Hope they are as good the second day. Thanks for sharing.